﻿Airlines and Digital. Improving the boarding process. Digital is a buzzword in many industries, especially the airline one. However it always seems to be applied as a tool to drive down costs for airlines by increasing automation, with customer experience as a by-product, rather than front and centre. I think this is a key area where airlines are missing a trick. With travel, especially in economy becoming increasingly commoditised and unbundled, it becomes a race to the bottom about who can transport people from A to B, most cheaply, rather than providing the best end to end experience. The legacy airlines simply don’t have the cost base to compete with new entrants and thus will never be able to get to that low headline price, unless they start to innovate on customer experience. Using Digital can be a key enabler in both reducing costs and improving the customer experience. One area of the passenger journey that is generally universally poor is the boarding process. I think the US airlines get this the most right, but it’s still not a great experience. American Airlines for example, have nine boarding groups. Depending on your elite status, you’re assigned a group number which is printed on your boarding pass and also displayed on the monitors by the gate. The agent starts with people eligible to pre-board (Concierge Key and those less able to walk), and then run through the rest of the groups sequentially. One of the problems with this though, is that people tend to crowd around the gate area making it tough to access the gate if you are in one of the earlier groups. These people are colloquially known as ‘gate lice’. But lets deconstruct the problem, why do people insist on boarding early in the first place? Mainly its so they can have space for their carry-on luggage so they don’t have to gate-check it. 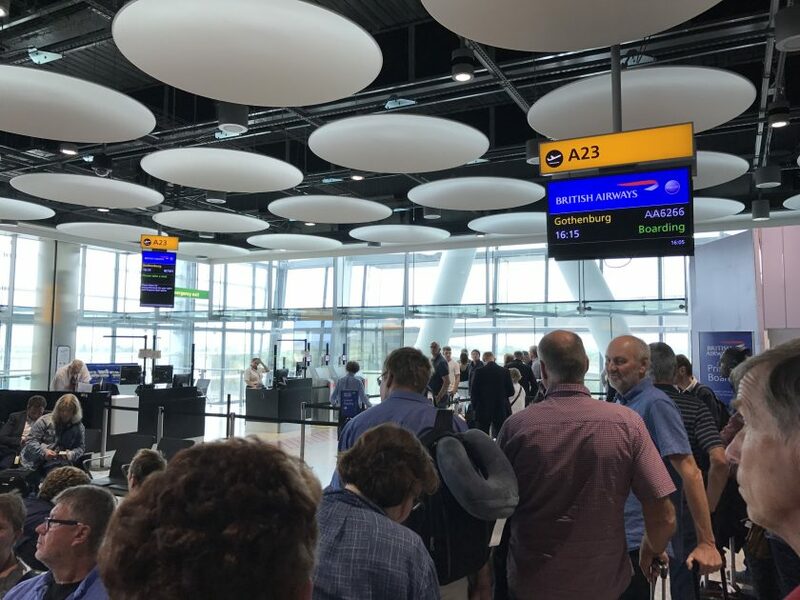 I’d personally much rather spend time in the lounges relaxing, than spending 45 minutes crowding round a packed gate, waiting for them to board, so I can be assured of a spot for my bags in the overhead lockers. The airlines therefore either need to ensure that there’s space for bags, or if people do check them in, they’re delivered in a reasonable time to the carousel, meaning they’re going to be less reluctant to part with them in the first place. Dealing with the second problem, airlines like Alaska have a 20 minute bag guarantee, meaning that if your checked bags don’t arrive on the belt within 20 minutes of the aircraft door opening, they’ll give you a $25 voucher or 2500 miles. However the first problem of ensuring sufficient space is a tougher nut to crack and airlines have been trying for many years to get this right. I think there are a variety of approaches that might help, leaving aside substantial capital investments in new overhead lockers which the likes of both Boeing and Airbus are delivering. The first items is assessing how big the problem is in the first place. During the online check-in process, most airlines ask how many checked bags people will be bringing to the airport; however they never ask the number or type of carry-on bags. For airlines like British Airways that allow two carry-on bags, getting a rough approximation of this could be helpful for both the boarding process and weight and balance calculations in general. Secondly, for those airlines that have adopted a group system for boarding, this could be done in an even more granular way. Many, many passengers have a smartphone with that particular airline’s app installed (I have quite a number)! I already receive push notifications when the gate number is announced and when boarding starts. However using this data, plus location data about where exactly I am in the airport could be used to provide information about when exactly I need to leave the lounge (based on which particular gate the aircraft is going from), plus how busy the gate area is (based on how many customers with smartphones are already there, in conjunction with the data collected about how many carry-on bags people are bringing. A London to Zurich flight on a Friday afternoon is going to be far busier than a mid-week Palma to London for example. Based on my airline elite status and some machine learning, the departure control system could alert me to head to the gate for the Zurich flight sooner, and then alert me to go to the boarding point itself for embarkation, without any announcements required by the staff. The departure control system could run through the elite tiers first (or indeed in any priority order). For those flights where they anticipate there being no issue with hand baggage, the system may not alert me until three quarters of the way through the boarding process to head to the gate so I can board near the end. Machine learning algorithms can quickly take all this data and understand individuals preferences and quirks. Some people may walk unusually quickly, travel with few bags etc. therefore could adapt to those and alter where one boards. Further, the step of validating one’s boarding pass (or even passport) could be automated as well. Currently, at a minimum the barcode or QR code gets scanned by a person (or an automated gate) when boarding the aircraft. These are either labour intensive or capital intensive bits of custom hardware. For most non-Schengen European flights, there’s the extra step of cross-checking a valid passport with that person’s boarding pass. Nearly every smartphone today has some kind of biometric authentication built in to it, whether it be a fingerprint sensor, or mechanisms like FaceID that are claimed to be far more accurate. Using entirely off-the-shelf, commodity hardware that most shops use to process contactless point of sale transactions, I’m sure airlines could use this technology to check a boarding pass and validate passport information at the same time. This would be cheaper than investing in physical gates as many are trialling now. The key change here would be rather than an airline building their own authentication hardware and software, they’re relying on the mechanisms already built into a modern smartphone, using the tried and trusted business process used for paying for goods (for example PCI:DSS) for validating identity. One could argue that is far more secure than a quick glance at an eight year old passport photo. In summary, airlines need to embrace Digital to improve customer experience as many will never be able to reach the cost base of their new entrant competitors. Using big data to solve a problem, improving it with machine learning, and tailoring it to suit an individual customer’s needs that are highly variable. Add all of these together and not only have to created a better boarding experience that’s unique to every individual, but you’ve also reduced costs without substantial capital investment in custom hardware, and done in a recognisably secure way. Innovating and disrupting the boarding process that remains one of the poorest parts of a traveller’s journey. Previous Post: Air France / KLM (might) be going revenue based. Next Post: Fare Deal. Europe to Australia in business for under €1900. To me, it has always been mindboggling why they don’t just have three lanes for the short hauls: Rows 1-10, 11-20, 21-30. On a plane only boarding through the front, board 21-30 first, 11-20 next and 1-10 last. If boarding through both front and rear, 11-20 first and then the other two simultaneously. I realize 1-10 would often be premium economy, and would expect pre-boarding – but if speed was key, this would be the way to go.